We have been watching the turmoil unfold in world markets with alarm. We will prepare a long blog about this, and the role that tax havens have played in all of it. We hope to bring you that tomorrow. In the meantime, to provide context for that future blog, and others that will doubtless follow on this economic earthquake, we are re-publishing another article from the last edition of Tax Justice Focus. It was written for us by Jim Stewart, Senior Lecturer in Finance at Trinity College, Dublin. As a primer on tax havens and economic instability, it's essential reading. There has been much analysis of this topic and various policy reforms have been proposed: these include looking at the role of ratings agencies, mark-to-market rules, greater transparency, and especially reform of financial regulation.Very little has been written, however, on the role in this crisis played by tax havens and offshore financial centres with “light touch” regulation. This article focuses on their role in the crisis and looks specifically at the Dublin International Financial Services Centre (IFSC,) where many of the funds that have collapsed or have been in difficulties are located. This shadow banking system has boomed over the last decade or so, as a variety of new players have evolved or emerged in the international financial system. Some are hedge funds or investment banks, or more arcane Conduits or Structured Investment Vehicles (SIVs) which are artificial structures created by banks or other institutions, off their balance sheets. These players in the shadow banking system behave rather like traditional banks – they borrow short-term money and then lend it again at longer-term maturities – but outside traditional regulatory structures. Instead of taking deposits, like “normal” banks do, they raise funds in other ways, such as by issuing commercial paper. The emerging financial problems in global markets have been described as “the worst financial crisis since the Great Depression.” The crisis is ongoing, and it is uncertain how deep or protracted it will be. One important reason for the lack of official attention to the growth of the shadow banking system was the extensive use of tax havens. Historically, hedge funds were often domiciled in the Cayman Islands, Bermuda or the British Virgin Islands. However, competition between financial centres on regulation (and tax) is considerable, and more recently European jurisdictions, notably the Channel Islands, Ireland and Luxembourg, have been “streamlining” regulation, among other things, to attract funds. In Ireland, for example, if the relevant documents are provided to the regulator by 3 p.m. the fund will be authorised the next day. A prospectus for a quoted instrument is a complex legal and financial document (a debt instrument issued by Sachsen Bank ran to 245 pages) so it is unlikely it could be adequately assessed between 3 p.m. and the normal close of business (5 p.m.) Even worse, Luxembourg has a new law stating that as long as the fund manager “notifies” the regulator within a month of launch, the fund can enjoy pre-authorisation approval. The Financial Times has noted that the Luxembourg regulator does not “scrutinise promoters”. Bear Stearns is so far the biggest institution to have collapsed from this credit crunch. Problems emerged in June 2007 when two Bear Stearns hedge funds incorporated in the Cayman Islands announced considerable losses. Bear Stearns had two investment funds and six debt securities listed on the Irish Stock Exchange, and it also operates three subsidiaries in the Dublin IFSC through a holding company, Bear Stearns Ireland Ltd., for which every $1 of equity financed $119 of gross assets – an exceedingly high (and in most circumstances dangerous) ratio. Yet despite the location of managed funds and substantial operations in Ireland, the Irish regulator does not feature in any media analysis or discussions relating to the insolvency and subsequent take-over of Bear Stearns. In an interview, the Irish regulator considers his remit is to ‘Irish banks’ – that is, banks that have their headquarters located in Ireland. Nineteen funds reported as facing difficulties in the sub-prime crisis, have been identified as located at the Dublin IFSC. Almost always, the IFSC link is not discussed. 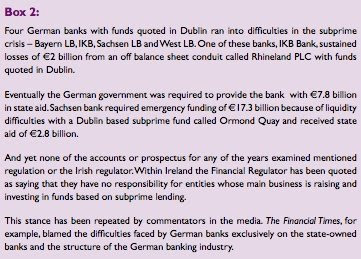 There is an exception, however: the case of four German banks (see Box 2). Between them, they required state aid from the German taxpayer totalling €16.8 billion as a result of the losses from the shadow banking system. Some people argue that financial innovation associated with risk management has been a major source of economic growth, particularly in the US. But “financial innovation,” in the current crisis appears to have motivated by opaque shifting of risk, and avoidance of regulation. We also recently re-published our editorial from the same edition, which provides more context, and is also worth reading.